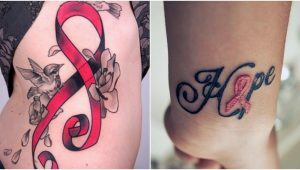 When you think of a Hollywood celebrity with many beautiful and inspirational tattoos, you rarely think of Demi Lovato among the first choices. The former Disney star is just 24 years old, and she is still perceived as an innocent child. She is not controversial, and her tattoos are really a work of art. 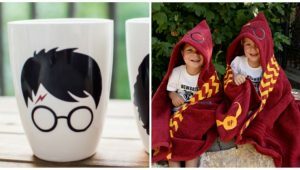 They are not plainly visible, but their meanings run deep. The singer sticks to subtle, elegant and beautiful tattoos, and there is nothing wrong in that. Let’s take a look at some of her tattoos and their meanings. She recently got a new tattoo, so this is probably the best time to take a look back at her other tattoos. Fun fact: Nobody noticed this tattoo for two years. 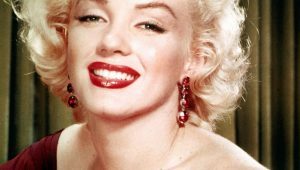 The words “you make me beautiful” are located on the right side of her ribs, and according to the former Disney star, she did it at the age of 16. Fans got the first look in 2010, just two months after the singer celebrated her 18th birthday. 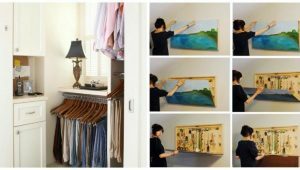 The phrase is directly taken from a song by Bethany Dillon, “Beautiful.” The singer says the song changed her life, and the words were encouraging and lifting. 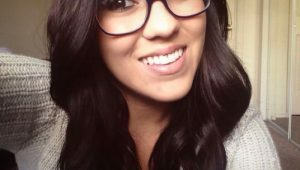 She heard the song when she was 13 years old, at a time she was at a dark place, battling with eating disorders, low self-esteem and much more. In 2011, she added a pair of feathers to complete the tattoo and make it more mystic. Not all tattoos have to have a meaning. This one, in particular, was done just for fun. The turquoise feather is located behind her left ear, and she has said a number of times it has no personal meaning. She just thinks the feather is cute, and we agree with her. She has also said that getting the tattoo while riding on the back of a bus during a tour in 2010 was “just stupid.” But, a bad idea can be a cute tattoo. 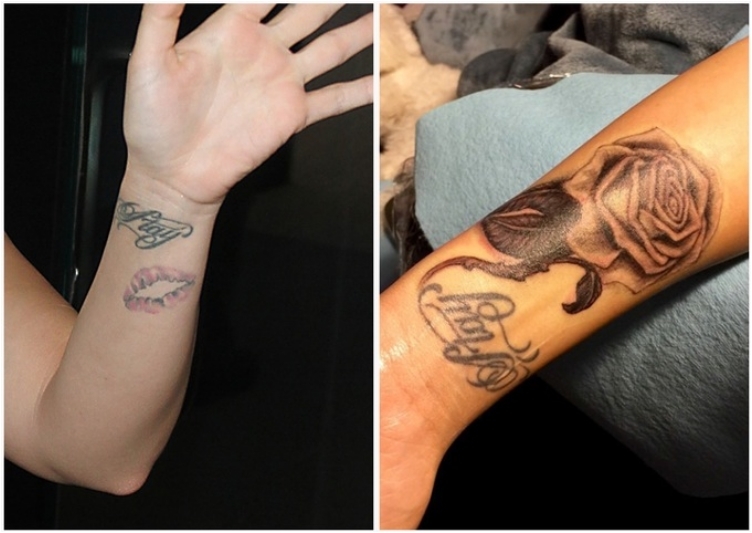 She reworked the tattoo in 2011. 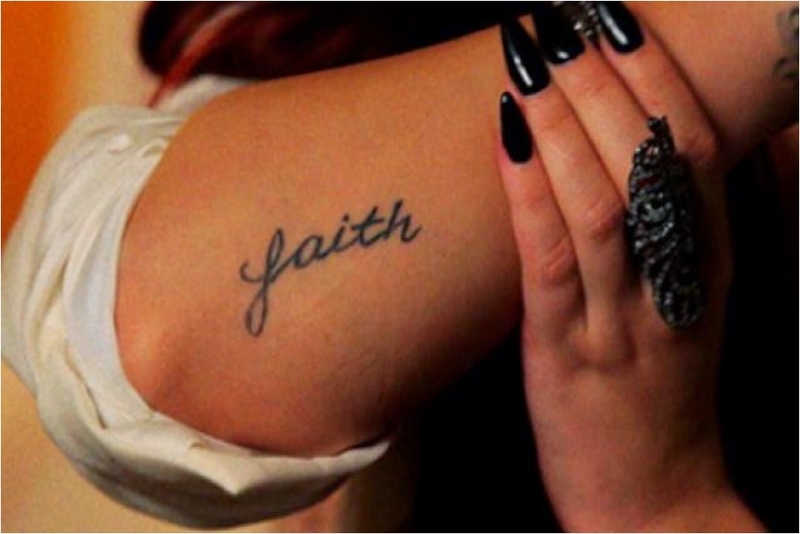 Lovato is very religious, and to honor her Christian religion, she got a cross tattoo on her right hand, just below the pinkie finger. It is an obvious tattoo, with no hidden message behind it. She said that she chose the area because she wants her fans to see the tattoo and her Christian devotion every time she holds a mic. 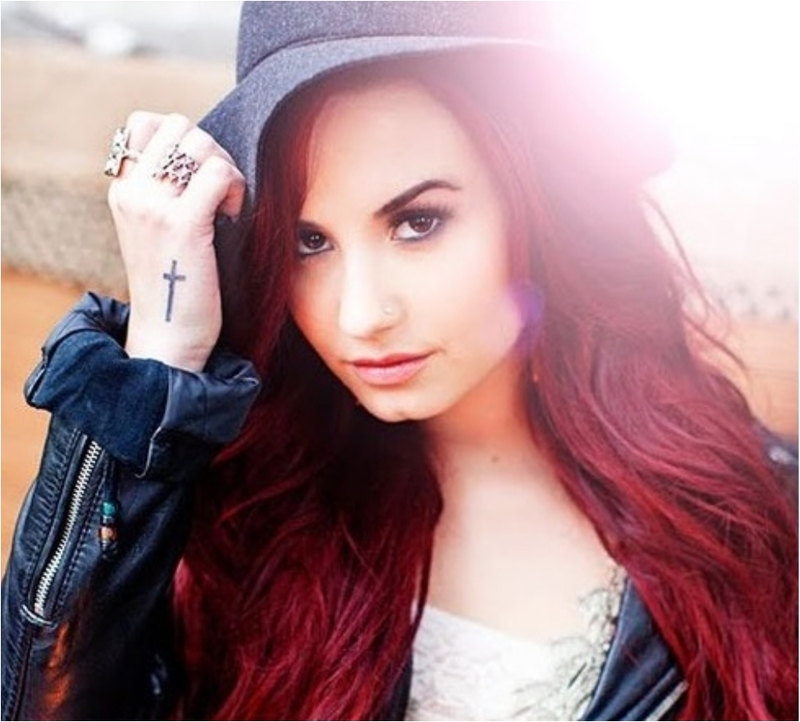 We said Lovato is Christian, and she is very devoted to religion. The cross tattoo is great example, but she also has “faith” written on her right arm. 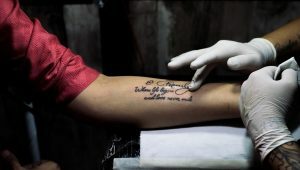 The tattoo is located below the elbow, and she did it in December 2011. As with many other tattoos, she didn’t tell her father, as he opposes tattoos. Another Christian-themed tattoo. You can we see we are having a pattern. The tattoo “Let go & Let God” is located on her feet, with “Let go &” on the right foot, while “Let God” is located on the left foot. On her right hand, on the middle finger, she has another finger tattoo, this time “Rock N Roll” written all over it. But don’t mistake Lovato for a rock artist. She is a pop artist, but Lovato has said she is a big fan of rock and roll music. Her friend, Hanna, also has a rock and roll tattoo, but on her hand. 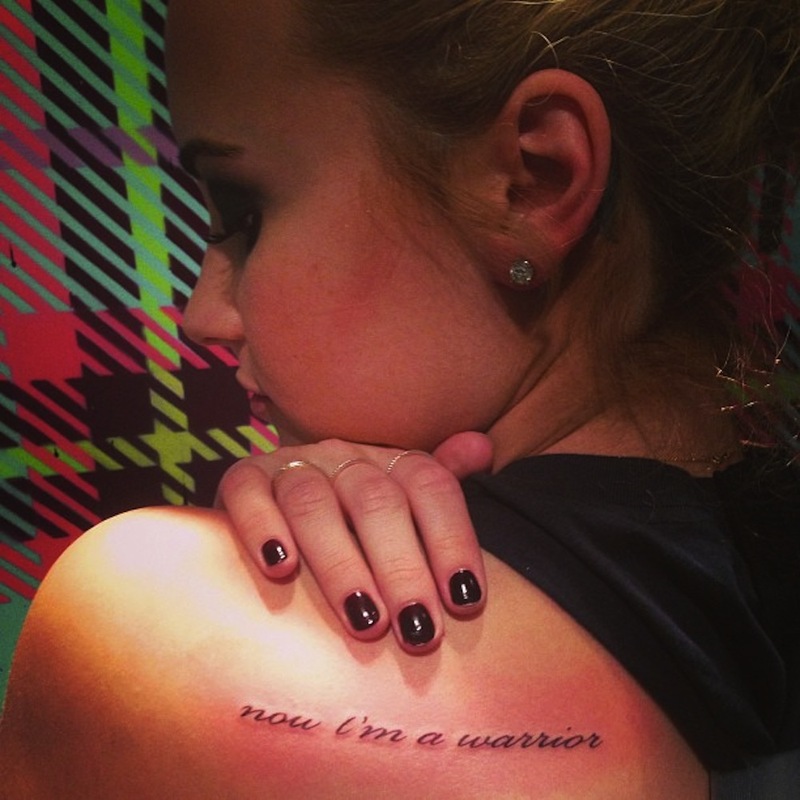 Lovato loves her tattoo, but this one in particular is probably a target for laser removal. She has said on a number of occasions that even though she loves her tattoos, she would consider removing some of them as they are youthful. 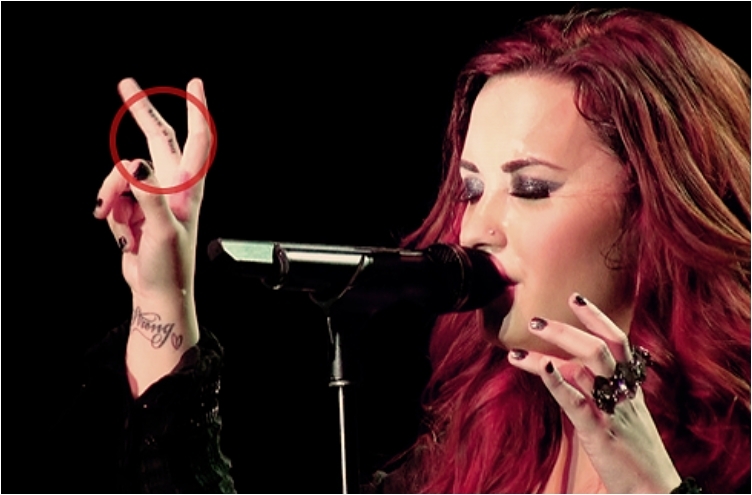 Some of the most discrete and subtle tattoos on Lovato’s body are located on her fingers. 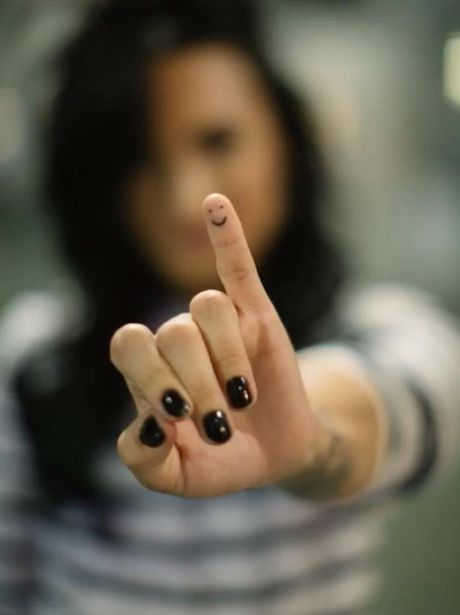 On her left hand, on the side of the middle finger, she has “peace” tattooed. 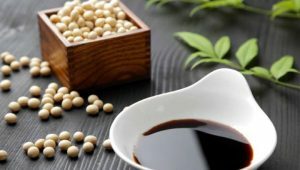 Many argue it is not an ideal area, because of the rubbing of fingers causes blurring and fading of the ink. In this case, it looks like the letter “e” is wearing off. Not all of her tattoos are hidden, but her finger ones are. 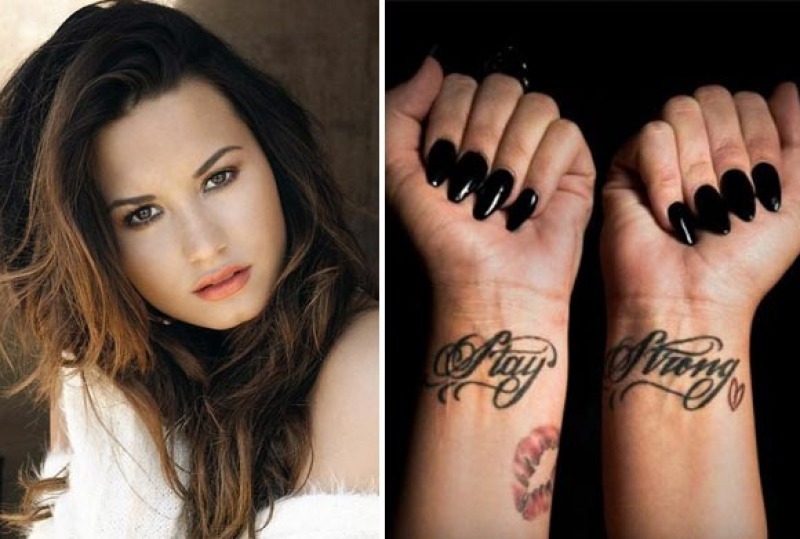 Her most famous tattoo is the one on her wrists, where she has written “stay strong.” She did the tattoo in March 2011 after spending three months in rehab, trying to fight bulimia and cutting. The message is just for her, as it reminds her of the bad times she went through. The tattoos also cover her scars on the wrists, an area she used to cut, serving as symbol for her recovery. She also has a heart tattoo under beneath the word strong, as a sentiment to her fans and their support in troubled times. In December 2013, Lovato wanted to pay a tribute to her dad who passed away in the summer. So, she did a tattoo of Roman numeral III. Her father died after a long battle with cancer, and Lovato has said the number three was his number. She admits that even though they did not have an ideal relationship, at the end of the day, he is still her father and he took care of her. Lovato has also set up a scholarship for patients with mental illness bearing his name. In July 2014, Lovato did a tattoo showing the outline of the continent of Africa. Her inspiration was Kenya, a country she visited during a mission trip where she volunteered as part of “Free the Children” initiative. The tattoo is located on the inside of her right forearm. She first wanted to ink Kenya, but she thought people wouldn’t recognize the shape. Lovato has said the journey was extremely inspirational. During her trip she helped build a new school and received a goat for her birthday by the people of Kenya. 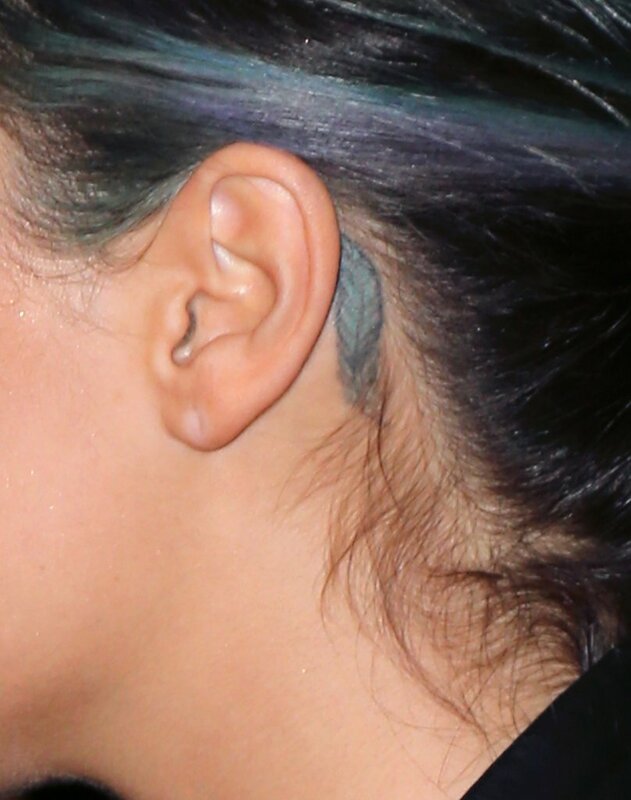 The feather behind the ear is not the only tattoo Lovato has done while touring on the end of a Warped Tour bus. She also had a red lips tattoo on her left wrist. 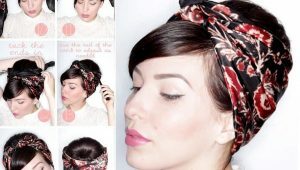 She did this one in July 2011 with her friend Hanna Beth Merjos, Lauren Pietra, and Ivey Ensley. All of them got a matching tattoo, with Hanna and Ivey placing the kiss on their collarbone. 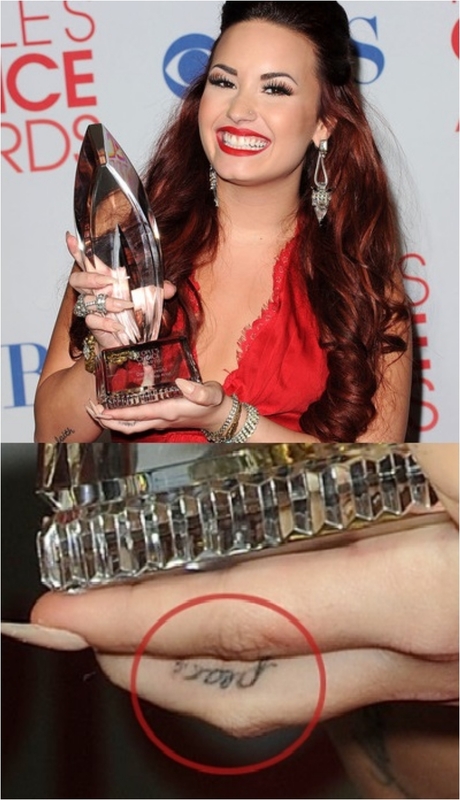 According to Lovato, the kiss is a friendship tattoo, and reminds her not to take life and herself too seriously. 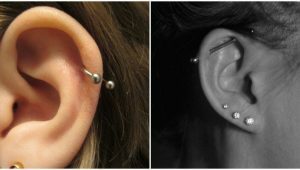 Again, a spur of the moment stupid decision, but we all have those. She did cover the tattoo later on with a rose. Since Lovato had little to no space to work on her body, she added roman numerals down the side of her rib cage. The numbers represent birth dates of all members of her family, including her biological dad, her stepfather, her mother and her sister. 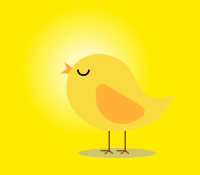 This design later appeared on her self-help book called “Staying Strong: 365 days a Year.” She did the flock of flying birds in November 2012. The tattoo surrounds her “faith” tattoo and has 12 black birds with swirls behind them. Lovato just revealed this tattoo a few days ago in an Instagram video. She captioned the video saying “Cause life’s too short not to tattoo your pinky,” and she is right. We don’t have to take life too seriously, and every now and then, a moment of fun and entertainment is welcomed. So the patients have to have the same name as her dad? Sentence structure. It matters.